Compared to that of chickens, the housing needs of waterfowl are relatively modest. 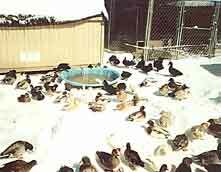 Housing for adult ducks in the Midwest can be any building that is tight enough to prevent entry by predators and that provides the birds the ability to get off of frozen ground and into clean, deep bedding during extremely cold weather. Left on their own, most ducks would prefer to sleep in the open in all but the coldest or wettest weather. Predators, however, make that impractical in the absence of a tight and secure covered pen. If such a pen is available, the large (non-bantam) breeds of ducks are usually quite content as long as they have a shelter with the attributes described above when the weather gets really nasty. They do not need a heated shelter and in fact do better when they are allowed to acclimate themselves to the cold without access to artificial heat. Bantam breeds need somewhat more protection from the weather because their smaller body mass makes it more difficult to "break even" with the cold. They should be driven into a shelter on a nightly basis unless the weather is mild. Like the larger ducks, however, they do best without artificial heat. 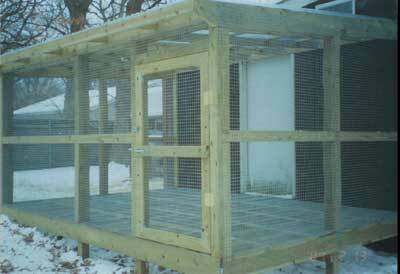 I use these 4x8 ft. raised cages extensively. They are secure from predators and are used by me for breeding and for conditioning birds for shows. 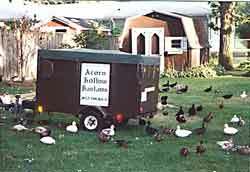 During the summer, spring and fall, I use raised cages for my bantam ducks when I am breeding them and conditioning them for shows. 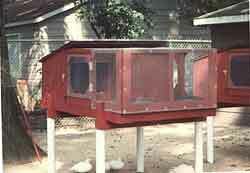 Such cages are secure from predators (see illustrations) and allow me to break them into small, easy to manage groups. 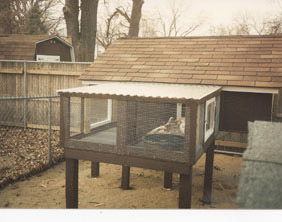 Growing ducklings are allowed to range during the day (see illustration) and are protected at night as they sleep in a predator proof building. There is no good substitute for good range for waterfowl. These young ducks at Acorn Hollow enjoy chasing down bugs. Winter scene at Acorn Hollow. The flock enjoys swimming in a small pool heated with a stock tank heater. The temperature was 11 degrees F. when this picture was taken. The housing needs of geese are even easier to accommodate since in all but the furthest north areas, they prefer to sleep outside all year around, and the larger breeds are not bothered by many of the common predators. A three -sided shelter open to the south and well bedded with straw is all they usually require. Fencing, however, is important, if predators such as coyotes and roaming dogs are in the general area as they are almost everywhere. A tight 6-foot fence should keep such animals out. Do not neglect this aspect of your facilities. The destruction of an entire flock by marauding dogs is a heartbreaking experience. Breeds such as the China and Egyptian need more predator protection than the big geese because of their smaller size and both would be best kept in a shelter or covered pen at night. The bottom line is that one must get to know which predators are in the area and plan for a worst case scenario. Do not make the mistake of underestimating the local wildlife. This newly constructed Mandarin pen at Acorn Hollow features a raised design, a translucent fiberglass roof, and access to an adjacent building for housing during the winter. The pen's dimensions are 15 ft. X 10 ft. Beyond security and protection from the weather, consider ease of upkeep when planning facilities. Some type of bathing water should be provided but pools need not be elaborate or expensive. When deciding how to provide such pools, think about ease of cleaning and where the pool water will go when it is emptied. By using a hose as a siphon, one can easily empty pool water well away from the pool itself. Paul Ashbrook in Washington State has developed these facilities for his large ducks and geese. His predators include coyotes, cougars, and black bear so his fences need to be especially sturdy. 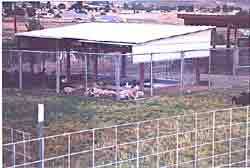 Irrigated pasture is provided for each flock since rainfall only amounts to about 10 inches per year in Paul's area. Do not allow mud to form in pens. It presents real sanitation hazards and keeping the birds clean in such a situation is a nightmare. Pens should allow plenty of square footage per bird (10-15 sq. ft per bird) and sand, gravel or other material that can be kept clean should form the base unless a good size pasture is available. Green shade such as trees, a grape arbor, or large shrubs is a big plus. If one is raising the bantam ducks in particular and hawks are common in your area, consider protecting at least part of their range area with game bird netting overhead. Do not overlook the availability of prefabricated panels of chain link fencing which can be obtained at moderate cost from most of the large home centers. Even when a pen is built of other materials, such panels make a strong and secure top that will never deteriorate like untreated wood will. 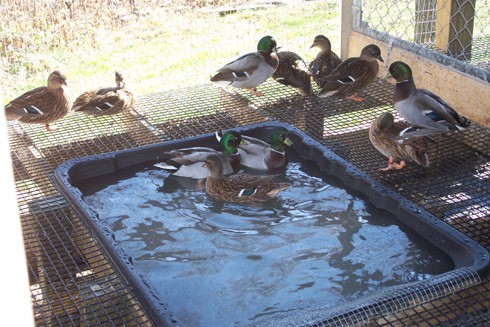 Given the fact that most types of waterfowl love to dig and dabble (Mallards are actually part of a group referred to as dabbling ducks), considerable thought should be given to preventing them from dabbling around their pools and water pans. One can surround such areas with deep sand (as I do) or one can lay in several inches of pea gravel or another similar material. Another factor to consider is how to provide a convient source of water. It is no fun to have to carry buckets of water long distances to the birds in the winter. Consider installing a "frostless hydrant" close to where you will need the water. Such a device (available at most farm supply outlets) is a hydrant that features a shut-off valve located about three feet down from the head. By burying that valve and the water line to it below the frost line, one can ensure the availability of water all winter even in the colder climates. Combine the frostless hydrant with the use of thermostatically controlled stock tank de-icers and one can easily provide birds with a constant supply of unfrozen water all through the winter. One of Paul Ashbrook's new waterfowl pens in Ohio. The wire floor is one inch hardware cloth which is plastic coated. The pool is flush with the wire and has a drain for easy cleaning. Any wood that comes into contact with water or the ground should be treated. Be sure to provide plenty of bracing support for a pool this size. Water weighs 8 lb. per gal. 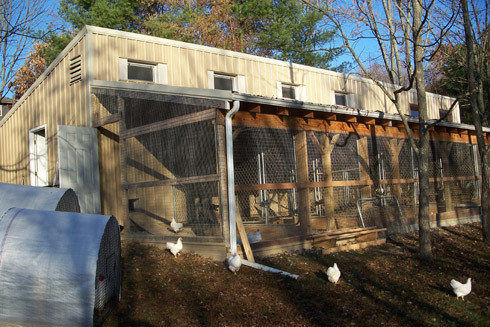 This is the front of the new Ashbrook building which houses both chickens and ducks in separate areas. Note the windows across the top for plenty of natural lighting. This is perhaps the best dual purpose building design I have seen to date. The pictures that accompany this article illustrate several ways to house waterfowl that have worked in the owner's particular situation. Give plenty of thought to your facilities before you invest the time and money in constructing them. It will be time well spent.